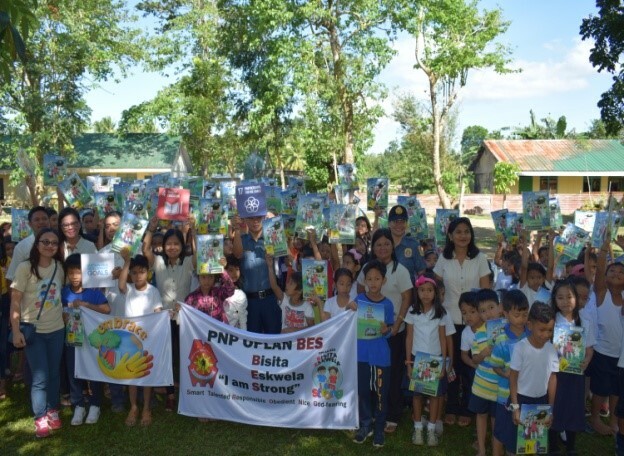 Schools in Camarines Norte Receives I am STRONG Activity Books – Jaime V. Ongpin Foundation, Inc.
Gabon and Cahabaan Elementary Schools – were blessed because their pupils received “I am STRONG” activity books from EMBRACE on February 7, 2019. In Gabon Elementary School, the principal welcomed the visitors from the Talisay Municipal Police Station (MPS) and EMBRACE / Jaime V. Ongpin Foundation, Inc. (JVOFI) team. She shared what happened to their classrooms that were burnt last year and she said it was a perfect time for the visit. They are reminded to be strong in every situation as what the word stands for in Oplan BES (Bisita Eskwela I Am STRONG), being Smart, Talented, Responsible, Obedient, Nice and God-fearing. The same program was conducted at Cahabaan Elementary School. The children were very responsive to the discussion of PSI Seguban on anti-bullying. When it came to the distribution of activity books, the children excitedly opened it and the coloring activity was facilitated. Before the activities ended, PSI Seguban added that the police are their friends and should not be feared of.